Grind paste-1 & paste-2 separately. Keep aside. Heat the oil in pressure cooker. Add mutton & 2 tsp salt cook till water evaporates. Note: Keep stirring in between while cooking. Add paste-1, tomato & fenugreek leaves, sauté till raw smell goes. Add paste-2, sauté for 3mins. Add water 2 glasses or according to the thickness you require. Add salt & adjust seasoning. 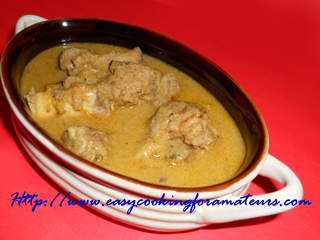 Mutton curry is ready to serve with rice. Delicious Mutton curry,delicious and creamy gravy,addition of Methi leaves sounds great. I don't cook much with mutton mostly because I have no experience with it and I am afraid of overcooking it. This looks delicious and something I can make. delish looking curry. you have a nice space here. love your recipes. wow so delicious...i can smell the aroma of the curry.less ingredients easy to prepare.i will try with chicken. so creamy and yummy!!! loved it.. This is really interesting! I'll visit this site more often to learn new things about French. I love this site! I'll recommend this to my friend!